In my garden I’ve had a couple of RSPB branded seed feeders mounted on poles for several years. Recently one of the transparent adapters twixt pole and feeder broke and after an exhaustive web search and a few phone calls I realised this style of adapter was no longer available. A black plastic pole adapter of a different design is, however, readily available. So I took the plunge and bought one online, hoping I might be able to use it to somehow reattach pole and feeder. A hammer and blunt chisel persuaded the remains of the threaded part of the broken adapter to unscrew from the feeder base, and I was pleased to find that the new adapter was of the same thread and fitted the feeder base perfectly. However the pole would not fit the other end of the adapter. The pole’s outside diameter is 24.5mm and it’s inside diameter is 22.5mm. The base of the new adapter has an outside diameter of 27.0mm and an inside diameter of 22.7mm. 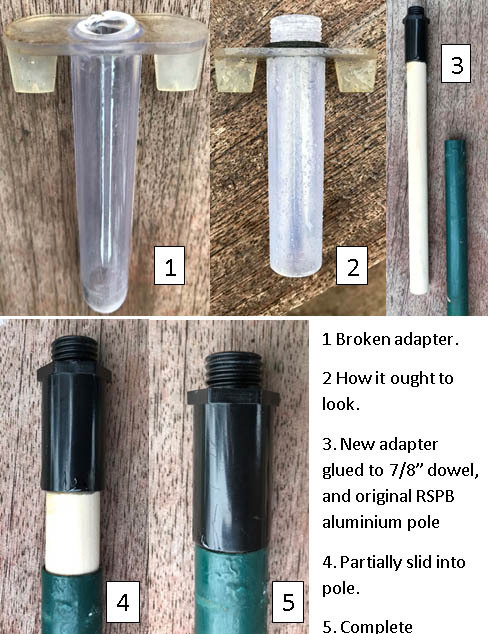 So I was able to solve the problem by using two part epoxy glue to stick a 15cm length of 7/8” dowel into the end of the new adapter, and then slide the dowel into the pole. (7/8” = 22.2mm) Everything is a nice snug fit - see photos. Who's a clever boy then!! well done Andy, where there's a will there's always a way !